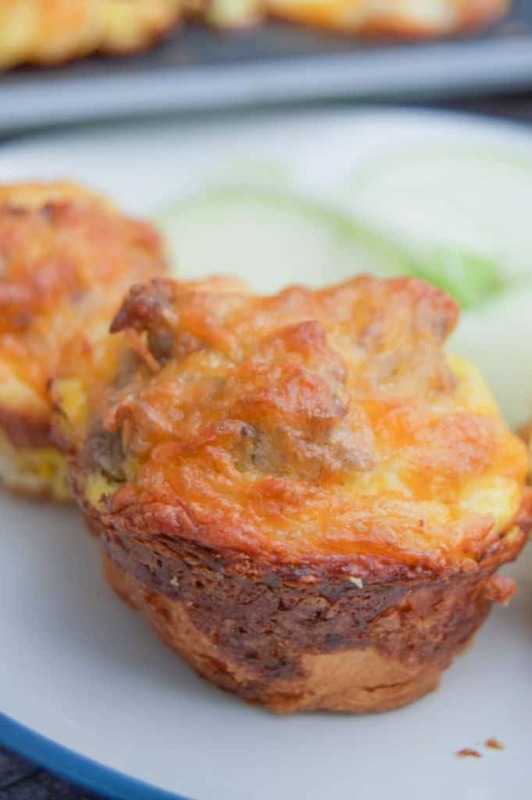 Easy to make Cheesy Sausage Egg Cups are the perfect breakfast recipe for the entire family. Make these ahead for a simple breakfast routine during the week. Serve with a side of fruit for a balance and filling meal. Breakfast can be a tricky when you have to be out the door early in the morning! I always want to make sure I get my kids a good breakfast in the morning, but sometimes cereal just wins out! 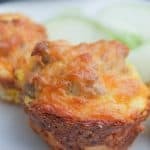 When I find an easy recipe like these Cheesy Sausage Egg Cups that can bake while we all get dressed and ready and can get from fridge to oven in less then 10 minutes, that’s a winning breakfast! Breakfast in a muffin tin are always a good idea, stop by and check out my Pancake Mini Muffins, another breakfast favorite of ours! Start by cooking your ground sausage and placing 1/2 a crescent roll into the bottom of a prepared muffin tin. 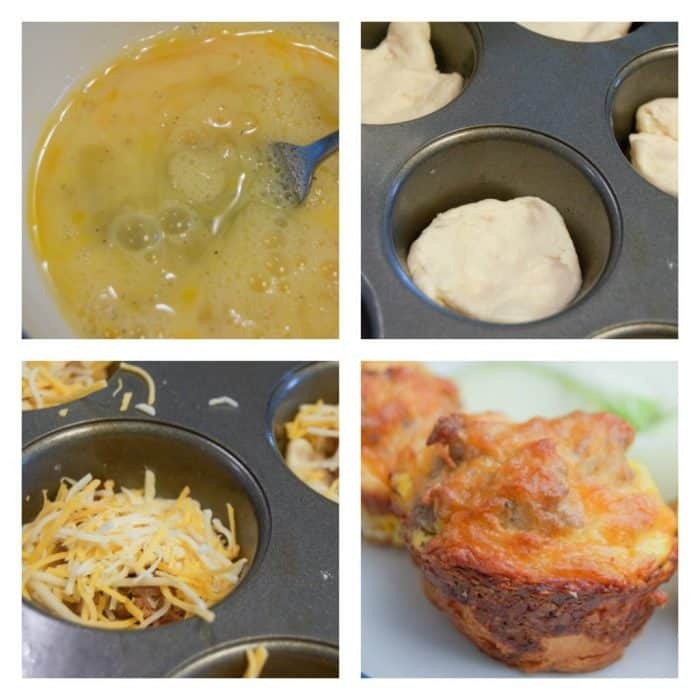 Place your sausage then whisked eggs into a the muffin tin and top with shredded cheese. It’s so simple to put them together and get them into the oven! After 12-15 minutes your Cheesy Sausage Egg Cups will be done. The best part of this breakfast, you can eat them on the run. You know those morning you are eating breakfast in the car and brushing your teeth in the bathroom when you get to where you are going 😉 Yeah this is a perfect breakfast for that! If you love easy recipes as much as I do make sure to stop by and check out my Family Friendly Dinner Recipes with 31 recipes and printable menu plans. 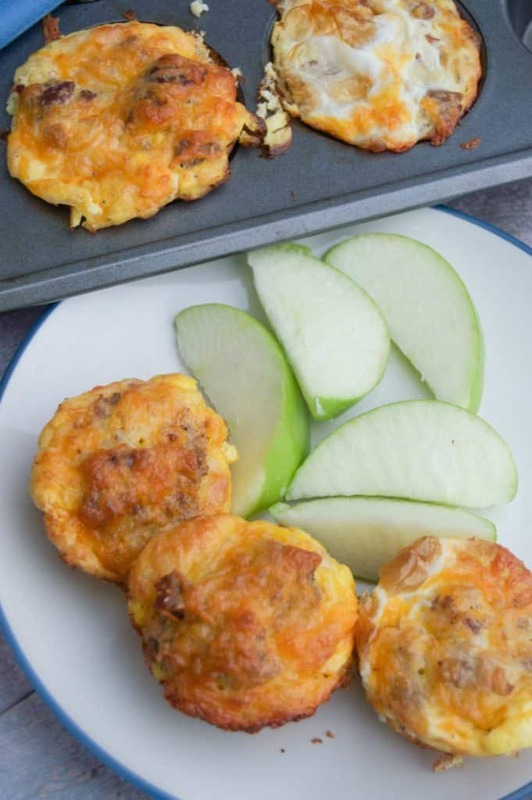 Easy to make Cheesy Sausage Egg Cups are the perfect breakfast recipe for the entire family. Make these ahead for a simple breakfast during the week. Preheat oven to 400 degrees F. Spray a muffin tin with non stick cooking spray and set aside. Cook sausage in a skillet, drain fat and set aside. Meanwhile cut crescent rolls in half and place them in the muffin tin. Press the dough down into the bottom of each muffin cup. In a separate bowl whisk together eggs, milks, and a dash of salt and pepper. Add cooked ground sausage to each muffin cup then fill each about 3/4 of the way full with egg mixture. Top each muffin with shredded cheese. Bake for 12-15 minutes or until eggs are cooked all the way though.